Crocuses are spring-blooming flowers that grow low to the ground with dainty blossoms. 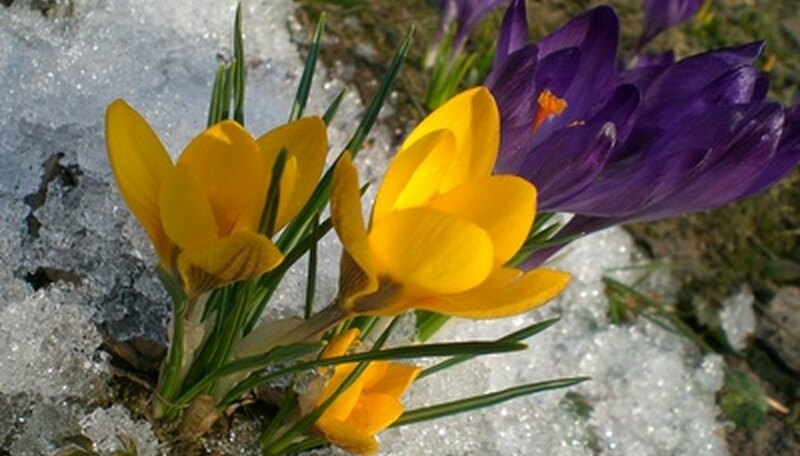 Due to the short stature of crocuses, they fall under the “minor bulb” classification. The typical planting configuration of crocuses involves naturalizing (random and scattered planting), planting as a groundcover and border planting in front of taller spring flowers. If you purchase your crocus bulbs before it is time to plant them, store the bulbs carefully to ensure their viability at planting time. Look carefully at each crocus bulb before you store it. Discard any bulbs that show evidence of damage or diseased. Decay from one bulb may spread to other bulbs during storage. Place the crocus bulbs into a paper bag and fold the top of the bag down to close it. Place the paper bag in a location with temperatures between 60 and 65 Fahrenheit. If the storage environment stays consistently at this temperature, you can store bulbs for up to four or five months. Do not allow the storage environment to climb above 70 F, because bulb damage can occur. Check the crocus bulbs when you bring them out of storage. Discard any bulbs with decay. Plant the crocus bulbs in well-draining soil when the soil temperature is below 60 F. Strive to place the bulbs in the soil approximately six weeks before the first hard frost of the autumn. Select a location with partial shade or full sun and plant the bulbs at a 3-inch depth with 4-inch spacing.